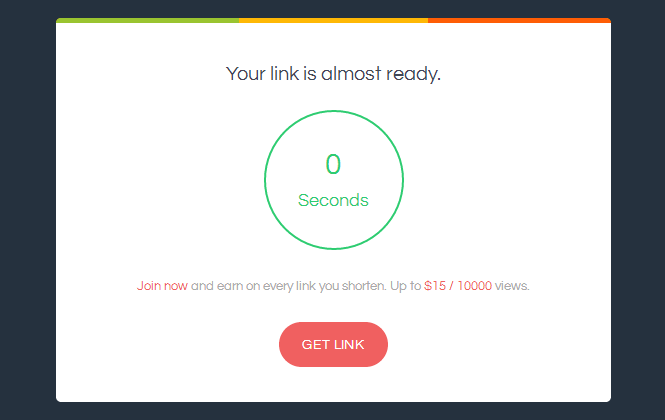 Ouo.io is a leading URL shortening service that allows you to shorten your links and make money with it. Based out of US, Ouo.io serves publishers worldwide with their service. For each legitimate user who visits your Ouo.io shortened links, you get paid. The payout rates offered by Ouo.io are quite good and varies for countries. Traffic from Tier 1 and Tier 2 countries receive higher revenue than the tier3 countries. If your traffic is from US, UK or Canada, you will see higher revenue from your traffic. Their minimum payout rate for every 1000 visits are $1.5 and the top tier countries traffic receives about $4.7 to $3.3. While most URL shortening services count only one unique as visit, Ouo.io also count page views, thus increasing your revenue. Ouo.io provides fairly simple, easy and minimum user interface to get started easily and maximize your earnings. They also have mobile support where you can shorten links and view your stats easily. 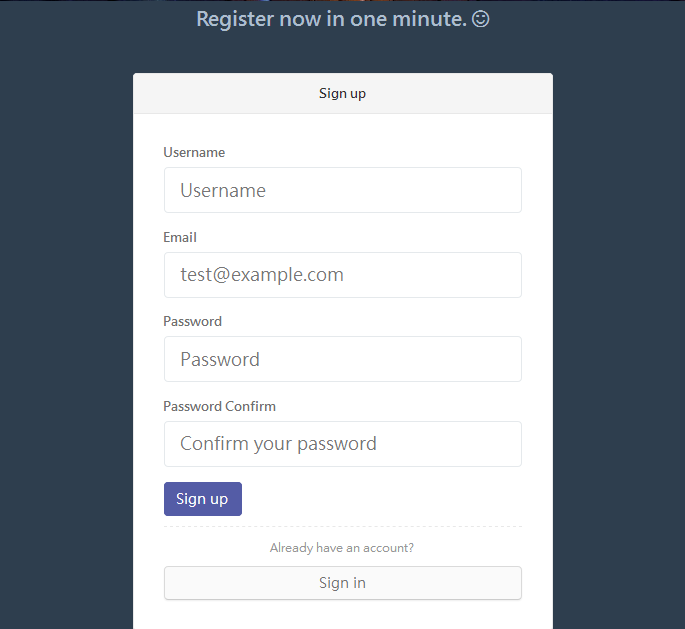 Signing Up with Ouo.io is fairly simple and it takes less than 1 minute to sign up. Simply fill up the basic details in the registration form and click Sign Up button. There is no approval required to get access to your account. Payout rates are comparatively higher than other URL shortening services. I have tried Shorte.st in the past, but the payout rates are less compared to Ouo.io. As I said earlier, they have higher payout rates for Tier 1 and Tier 2 country traffics. They also have this minimum payout rate of $1.5 available for all other countries which is really good considering how cheap other services are offering. Below is the list of Payout Rates for countries. Ouo.io has simple and easy user interface and you can see this in their dashboard. 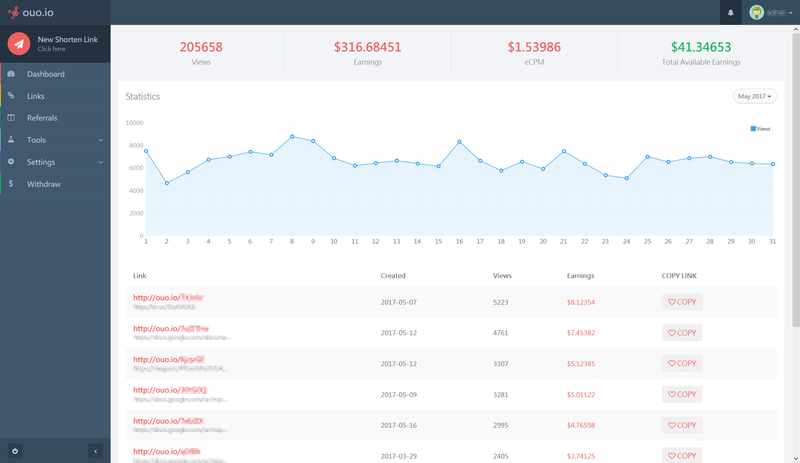 In their dashboard you can see all the stats which provides all the necessary details like eCPM, views, daily earnings, monthly earnings, total available earnings, stats for each links and more. The stats are updated in real time. Ouo.io provides three very important tools to publishers such as mass shrinker, quick link and full page script. Each of these tools can save you a lot of time if you are having a website with lots of links. Mass Shrinker: As the name suggest, you can shrink your links in bulk. All you have to do is to enter each URL in a line and then click “Submit” button. Quick Link: This tool allows you to shrink your url just by appending your original URL to the below url. Full Page Script: This tool allows you to change your links to Ouo.io short links if you have more than 100 or 1000 links in your website. You will need to add a simple script which will do your job easy. With Ouo.io, you don’t have to worry about higher minimum payouts. You will get paid as long as your minimum balance is $5. 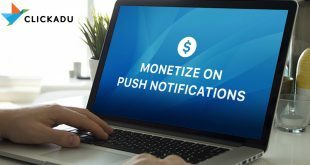 Ouo.io automatically processes the payments on 1st and 15th of every month via PayPal and Payza. If in any case you don’t make $5 minimum balance, then your existing available balance will be carried to the next payment cycle. With Ouo.io, you can also make money using referral program. You can refer your friends, family or your visitors to earn a 20% commission for lifetime. It provides various banners ad formats that you can use for referral income. 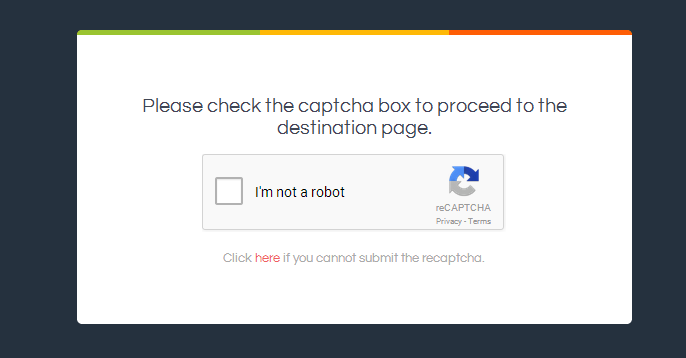 When the visitor clicks on your shortened link, there goes a two step process where they have to first click on a Captcha shown below to go to their destination page. Once the visitor submit the Captcha, they are taken to the following page where they get the actual link to the destination page. They click on the “Get Link” button and are taken to the destination page. Ouo.io works with Popunders and hence I believe it is better than the services which offer Interstitial ads. One can simply assume, how big Ouo.io service is considering their Alexa and SimilarWeb rankings. They are simple, easy and compact service with great support and efficient tools for publishers to make money. You don’t need to have a website to shrink your links and make money, you can simple shrink almost any URL and share it with your friends, family or visitors; you can share it on your social media accounts, pages and more. By far, Ouo.io has been a fairly good service for making that extra money with your website. Simple, easy and efficient way to make the extra money from your website and social media accounts. Support is really good and payments are made in timely manner via PayPal and Payza. Comparatively better than other URL shortening services. But This Site is Trusted …..